After an all-day show at the Excel in London, which ridiculously finished at around 1.20 a.m. on Sunday morning, some thoughts and opinions were enhanced whilst others were refuted and yet more questions were raised than were answered. This is always the way after a good show, and it was a good show despite a couple of major disappointments. Here are some observations that I made following the marathon card. I am even more convinced than ever that Billy Joe Saunders will never be an elite middleweight. Neither will he ever beat an elite middleweight. However, in our world of plenty (as far as alphabet belts are concerned), this will not preclude him from winning one of the same. Even ordinary fighters are able to win these trinkets and call themselves world champion. By the way, I am not describing Billy Joe as an ordinary fighter. He showed tremendous skill, heart, will, and last but by no means least, chin, as he managed to stave off the desperate lunging attacks of Chris Eubank Jr. on Saturday night. The reason for my harsh analysis of his standing in the division though relates to the fact that he has now fought two men who could be considered no more than very promising prospects at domestic level, in Eubank Jr. and previously John Ryder, and defeated them both by no more than a whisker. In fact, both fights followed a similar pattern, in that Billy Joe got off to a big early lead by dint of his classy boxing, speed and movement, but as each fight progressed, the opponent was able to virtually brush him aside and come on strong down the stretch. It is interesting to note that in both fights Billy Joe lost the last two rounds and was hanging on for grim death by the end. As a relatively small middleweight he will always be bullied by the beasts of the division, e.g., Martin Murray. The reward for Saunders is to be a crack at the winner of the upcoming vacant WBO title fight between Russian Matt Korobov and Irishman Andy Lee. Korobov will, understandably, be a hot favourite in that fight, and really should beat Lee, but to date he has shown little to make Billy Joe shudder in his boots. Korobov is not an elite middleweight either. In fact, he has been a major disappointment as a professional. Despite being unbeaten, he has failed to impress more often than not. I am not sure if Billy Joe will be able to beat him, but he will be far from outclassed if/when that fight comes off. Of course, Saunders promised the subdued Eubank Jr. a rematch, and first shot at his new belt, should he win that title. After such a close call Frank Warren might have something to say about that. As for Eubank Jr., how he must be kicking himself in the days following the fight. He will know that this is a fight he most definitely could have won, but for inexplicably failing to engage with his opponent in the opening five rounds. By employing this strange tactic he left himself with too much to do and despite his desperate efforts in the second half of the fight, he was unable to overhaul Billy Joe’s early lead for two of the judges. He came mighty close though. 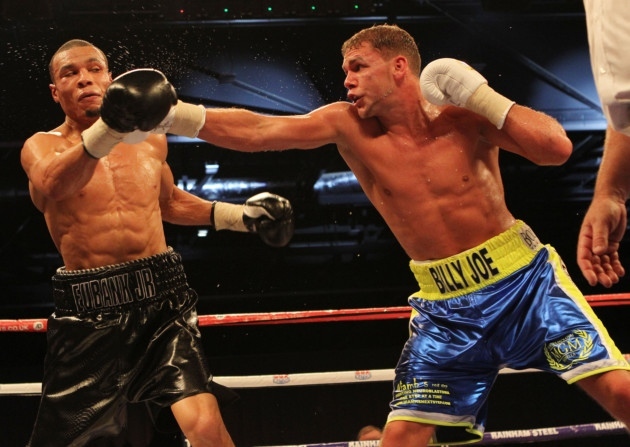 Looking at Eubank Jr. it is apparent that he has so much more to offer. However, it was cringeworthy watching him throwing wide and wild hooks and uppercuts, the vast majority of which missed by a mile. When he did land though he made Saunders look very uncomfortable and he clearly has decent power. What he desperately needs now is to add a few subtleties to his game. As it stands, his footwork is poor and incorrect, sending him falling off balance time after time when missing with shots. He also needs to understand that as he steps up in class, he will be unable to simply blow his opponents away. He must have been dismayed that Billy Joe was able to stand up to his best shots. What he most needs to do though is to lose his father. Mr Eubank is living a second boxing career vicariously through his son. His name has definitely opened many doors for Jr. to date, getting him through to this point in his career and earning him some big bucks for this fight. However, he now has a duty to his son to step back and let him get on with it. It is farcical to watch him standing in the corner, as chief second, whilst Ronnie Davies has to bend through the ropes and seems uncertain as to whether he is allowed to speak or not. What is Eubank doing other than satisfying his yearning to be back in the public eye? Sit at ringside man and let them get on with it! Even then, when Davies was doing most of the talking in the latter part of the fight, the only advice seemed to be “get in there and knock him out”. Eubank Jr. needs to drop the ego too and get people around him who will take him on to the next level. He might think he knows it all but from the evidence of Saturday he has heaps to learn. I hope he heeds the warning signs, otherwise he will end up as a wasted talent. Whilst that fight lived up to all hopes and expectations, the main event between Tyson Fury and Dereck Chisora was a major let down. This was a fight which this writer could never get excited over, considering the relative ease with which Fury had already defeated Chisora. However, I certainly expected more than we got. It seemed to me that Chisora was a beaten man before he ever got into the ring. Fury exudes supreme confidence and displays such braggadocio that one can easily see how Chisora had been browbeaten into defeat in the weeks leading up to the fight. He really had nothing to offer on the night and it was a most pathetic challenge put forth by the Finchley man. Despite Fury receiving deserved praise for his performance, using the southpaw stance throughout the whole fight and boxing his man’s ears off, I for one was disappointed that he did not start to step in with his shots. Chisora was just looking to be taken out of there and several sustained attacks by Fury would have given the referee, or Chisora’s corner, the excuse to pull him out several rounds before the eventual ending. Fury’s stablemate Eddie Chambers, in commentary, said that what fans have to understand is that fighters’ health is at risk and they should not have to take unnecessary risks in the ring “it’s all about the W” I believe he said. What Eddie Chambers has to understand is that, really, “it’s all about the fans”, as without the paying customers there would be no sport in the first place – you cannot bore them to death. Having said that, it was a masterful performance by the self-styled Gypsy Warrior. He is undoubtedly one of the best three heavyweights in the world and deserves his shot at champion Wladimir sooner rather than later. It may be though that Wlad is headed in the opposite direction, as he is now preparing to return to HBO screens next year. The biggest seller for HBO would be that other member of the triumvirate, Deontay Wilder, assuming the latter takes the WBC belt from Bermane Stiverne in January. We will hear the old turkey from Tyson about Wlad ducking him. Do not believe this for a minute. Although Fury is a better and far more skilled operator than Wilder, Deontay’s one-punch power carries much more of a threat to the champion than does anything Tyson could confront him with. To Frankie Gavin now, and what a struggle he had dealing with Bradley Skeete on Saturday. It may have come across as a bore to some watchers, but for me this was a tense, intriguing and thoroughly enjoyable battle all the way through. It must be remembered that Gavin’s top-level career was on the line in this fight – he simply had to win. Skeete was under no such pressure and knew that if he lost there would very possibly be another chance to take the British title in the near future, assuming that Frankie now relinquishes. If he does so then Bradley must be one of the fighters to battle for the vacant belt, as he pushed the champion all the way. In virtually every round the fighters were separated by only a handful of punches. The judges definitely got the right winner, as it was Frankie forcing the fight and throwing just a few more back hands than Bradley could muster. Once again though Gavin finished the fight marked up and asking his corner whether he had won or not. It is a shame but he simply does not have the power to subdue opponents above a certain level. As shown in his fight with Leonard Bundu too, he can be hurt. It is difficult to see how much further Gavin can go. Should Bundu relinquish the European title then Frankie is certainly good enough to win that. He would have to be very carefully matched though, and perhaps get a shot at a vacant belt in order to win an alphabet title. In this deepest of all divisions, there are some serious monsters in the upper echelons of the welterweight ratings who would really put a hurting on Gavin. A word for the other main fighters on the card and Liam Walsh had an unexpectedly simple victory over Gary Sykes. Perhaps it was the knockdown he suffered in the opening round, but Sykes looked a shadow of his former self throughout the fight. To be blunt he appears to be a fighter in real decline, making Walsh look like a world beater. It was not that long ago that Walsh had a terrific struggle to closely overcome Joe Murray and I expected something akin to that on Saturday, but it turned out to be a cakewalk for him. Walsh now needs to counsel his promoter to get his career moving. He is a rare talent and is another fighter who could take the European title right now. Frank Buglioni is going nowhere. Harsh, but true. He does not seem to be making any progress and his statuesque stance as he comes forward will always leave him open to that fateful right hand punch over the top of his left. Once more on Saturday he was caught time and again by little more than a novice in Andrew Robinson. It was a great, exciting fight and it cannot be denied that Frank is one of the most thrilling watches around, for his vulnerability if nothing else. He really should be putting fighters like Robinson to the sword now though. The fact is that a knockdown in Frank’s favour in the seventh round was the only thing preventing Robinson snatching a draw on my card. It was a round which Robinson was winning until he walked onto that fantastic left hook of Frank’s which took his legs away. The two point swing on the cards that brought was enough for Frank to score another victory. Frank will continue to be difficult to match bearing in mind his deficiencies. The most stultifying fight on the main card featured Mitchell Smith, who huffed and puffed but could not put his Hungarian opponent away. The crowd watched in virtual silence as Mitchell did his best to subdue a man who was brave but nothing else. What made it worse was Smith’s ridiculous showboating and throwing his arms up in the air at the end of rounds. Someone needed to explain to Mitch that this was not the real European title he was fighting for but rather the ridiculous WBO bauble. He also should have been told that he was in with a journeyman. If Smith thinks he is now boxing and winning at European level he is in cloud cuckoo land. He should be getting the likes of Zoltan Kovacs out of there and putting crowds out of their misery. Barry Jones in commentary probably hit the nail on the head when recommending that Mitchell should move down to featherweight. He is just too small to have any major impact at the higher weight. All in all then, despite a couple of disappointments, it was an excellent show, with the magnanimous reaction of Saunders and Eubank Jr. in their post-fight interviews being exemplary to all. Well done to both guys. STARring Timothy “Desert Storm” Bradley!